Canada is home to millions of Refugee Champions. Refugee Champions include refugees who have made a new home in Canada as well as all those who welcome refugees to Canada. Some Champions arrived many years ago and after being supported as refugees are now reaching out to welcome others. Some Champions fled their home, family and career to start over in places where their skills and abilities were not fully recognized, but who, none the less, created a new and meaningful life in Canada. Other Champions have supported refugees in Canada, individually or through groups. Some have a long history of welcoming refugees; others are new to the experience. Refugee Champions are people of all ages from all faith, cultural and linguistic backgrounds. They reflect the diversity of Canada and are proud to welcome refugees to our country. Refugee Champions are ready to defend the human rights of refugees, including the right to seek asylum and be free from persecution. 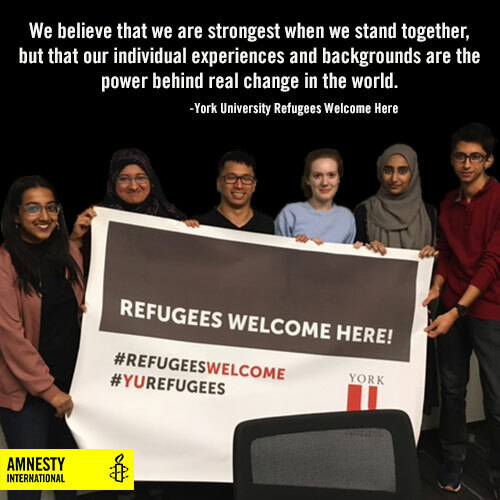 Amnesty International is profiling Refugee Champions across Canada. You can add your profile, or that of a friend, to our Refugee Champions site by telling us who you are and why you or your friend(s) are refugee champions!